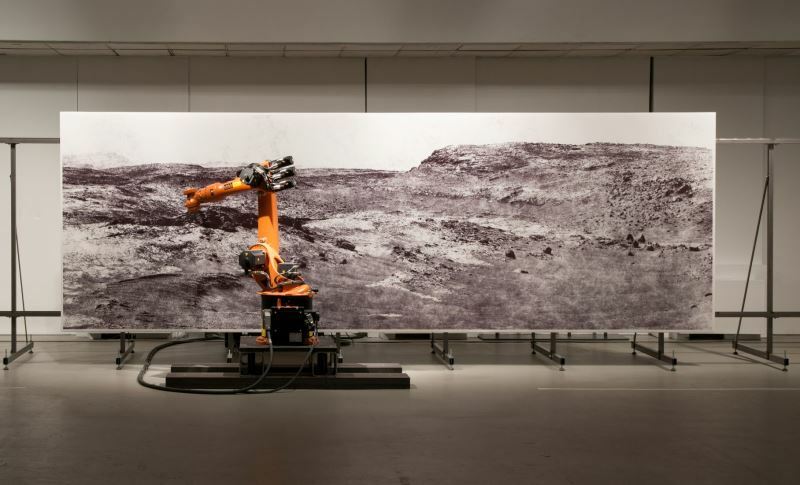 The Taichung-based National Taiwan Museum of Fine Arts will play host to KUKA, an industrial robot programmed by German art collective robotlab, as it embarks on a four-month journey illustrating the Martian landscape with one unbroken line. The epic endeavor, based on imagery sent from NASA's Curiosity rover, will start on Jan. 19 on a blank slate and is programmed for completion on May 12. 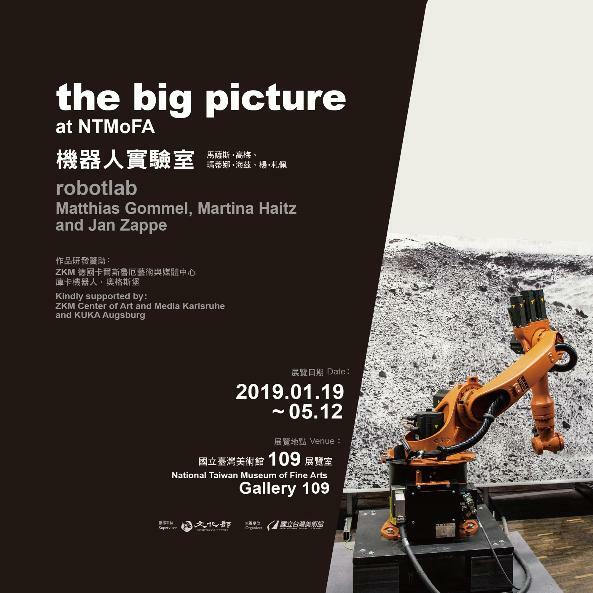 The exhibition is named "the big picture at NTMoFA," after the title of a large-scale installation of mechanical art-making developed in 2014 by robotlab, a German artist group associated with the ZKM Center of Art and Media in Karlsruhe, Germany. Blazing a new trail in the field of precision machinery, the robot's motions are controlled by complex algorithms that can adjust its operations and ensure precise, controlled output. For the upcoming Taichung exhibition, the artist group will reprocess images beamed back to Earth by Curiosity, a car-sized rover that landed in Gale Crater on Mars in August 2012, ingeniously transfiguring the landscapes of this mysterious red planet into an unbroken line. Dictated by a sophisticated computerized system, hundreds of kilometers of one singular stroke will dance to the robot's tune and gradually converge towards a huge, inimitable, and photorealistic drawing. As the robot's take on the Martian landscape will be on a vast scale almost beyond physical human limits, the exhibition's organizers hope to invoke contemplation on the subject-object relationship between humanity and machinery that was defined by the Second Industrial Revolution, and whether such relations will change if technological development continues to run its current course. Ultimately, an enchanting utopian world in which humanity and machinery co-exist in symbiosis will incrementally manifest itself in the innumerable layers of abstract line on this huge canvas. robotlab was founded in 2000 by Matthias Gommel, Martina Haitz, and Jan Zappe at the ZKM Center for Art and Media in Karlsruhe, Germany. The collective explores mankind's ties with machinery through robotics normally used for industrial production. In robotlab's installations, the role of the machine is always defined as that of an autonomous, creative agent. 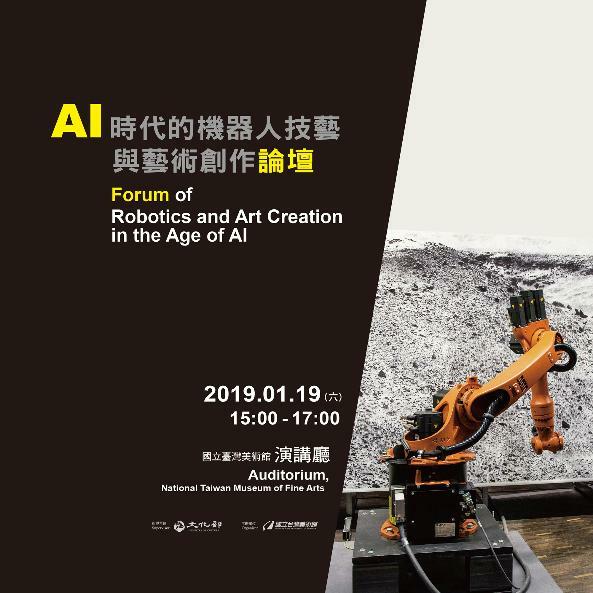 The Taichung exhibition will kick off on Jan. 19 with an international forum delving into robotics and artistic creation in the age of artificial intelligence. Members of robotlab will be in attendance. Visitors Today:166. All Time Visitors:1,229,973.